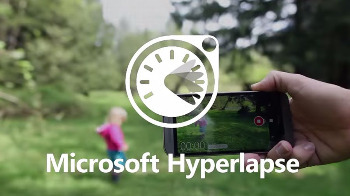 Microsoft Hyperlapse is a new technology that creates smooth and stabilized time lapses from first-person videos. Want to show your friends what you saw on that 12-mile hike you took last weekend or let them experience how it felt to fly down the mountain on your recent ski trip? With Microsoft Hyperlapse, you can time lapse those experiences, distilling them into easily consumable, enjoyable experiences. Microsoft’s hyperlapse technology is built on more than 20 years of research in computational photography. For more details on the research behind Hyperlapse please see our recent papers from SIGGRAPH 2014 and 2015. Our pro version is for enthusiasts and professionals who want to use a Windows desktop application to hyperlapse videos they took with a GoPro or any other device. It’s obvious and easy to notice the difference between a professionally made video clip v.s. a home video. Video stabilization is one of the areas home videos lack. While the professionally made video clips hardly have unintentional shakes, the home-made ones or those straight from your cellphone cameras are usually tend to be underwhelming shaky. Much like Instagram’s Hyperlapse, Microsoft Hyperlapse Pro is a new technology that helps you to convert any shaky video into smooth and stabilized time-lapse videos. It is optimized for GoPro action cameras but not limited to those specific camera. Any video clip would work with Microsoft Hyperlapse Pro, videos you take from any cellphone camera would work. Takes advantage of multi-core CPUs and high-end GPUs for better processing speeds.